I had a business at Dipati Ukur Street that morning. I guessed it would take hours. But I was wrong. It was still 10 a.m. when I finished it. I had no plan to travel in Bandung. But I was near Gasibu, Gedung Sate, and Geology Museum. Why didn’t I visit the museum at once? So I headed toward Diponegoro Street. Geology Museum was built on May 16th, 1928. Here, there are many geology materials, collected since 1850. The building itself previously was named Geologisch Museum, designed in Art Deco by the engineering Menalda van Schouwenburg. It was built by 300 workers and wasted 400 Gulden. As I read, the construction was started in the middle of 1928 and inaugurated on May 16th, 1929, coincided with Fourth Pacific Science Congress which was held in Bandung, West Java Province, from May 18th to 24th, 1929. In 1999, Geology Museum received an aid from Japan about 754.5 million yen for the renovation. Then the museum was closed, and opened again on August 20th, 2000. This moment was inaugurated by the Indonesia vice president, Megawati Soekarnoputri, accompanied by the Ministry of Mines and Energy, Susilo Bambang Yudhoyono. I wrote my name on the museum’s guest book. Then I entered the room in west called Ruang Sayap Barat or Indonesia Geology Room. Geology Room consists of some little rooms that give you information about the born of the earth and the geology of Sumatra, Java, Sulawesi, Maluku, Nusa Tenggara and Papua. There are also the stones, fossils of human history by Charles Darwin, minerals in Indonesia, and the tools used for the research. In the end of the Geology Room, there is a room that can tell and show you about the volcano, such as Tangkuban Perahu, Krakatau, Galunggung, Merapi and Batu. The east room or Ruang Sayap Timur gives you the information about the fossils. Aaah, I saw T. Rex there! It’s tall like on the movie. A Tyrannosaurus Rex Osborn’s length could reach 19 meters, tall 6.5 meters and weight 8 tons. 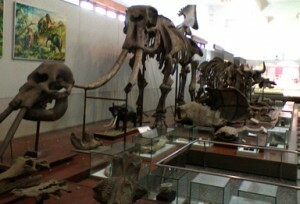 In the other side, there are the fossils of rhino, hippopotamus, ox, and elephant. In this room you will find also the history of the creatures, from the primitive until the modern era. This museum also collected the fossil of prehistoric men, Homo erectus, also the artifacts they used. Near the entrance of the room you can also see the history of Bandung Lake, the fossil of the snake and fish discovered in the land ex Bandung Lake. Enough of eyeing, I went out the museum. I saw a little shop that sells souvenirs. Here the visitors may buy the accessories made of stones or any souvenir that can remind them of this place. Interested to go to this museum? Ah, come on, the museums in Indonesia lack of visitor. Help it to live. Visit it sometime. Itu beneran tulang-belulang T-Rex kah? Yang jelas, itu bukan tulang ayam, hehehe. Kenapa, Brahm? Mau makan tulang T-Rex? .-= Rie´s last blog ..Anrum =-. Thanks for a great post and interesting comments. I found this post while searching the web for free downloads. Thanks for sharing this article. apa emang susunan tulangnya begitu ya? Heuheu… yg aku liat sih gitu. .-= Rie´s last blog ..diam =-.